Modern city-dwellers suffer their share of unpleasant experiences-traffic jams, noisy neighbors, pollution, food scares-but urban nuisances of the past existed on a different scale entirely, this book explains in vivid detail. Focusing on offenses to the eyes, ears, noses, taste buds, and skin of inhabitants of England's pre-Industrial Revolution cities, Hubbub transports us to a world in which residents were scarred by smallpox, refuse rotted in the streets, pigs and dogs roamed free, and food hygiene consisted of little more than spit and polish. Through the stories of a large cast of characters from varied walks of life, the book compares what daily life was like in different cities across England from 1600 to 1770. Using a vast array of sources, from novels to records of urban administration to diaries, Emily Cockayne populates her book with anecdotes from the quirky lives of the famous and the obscure-all of whom confronted urban nuisances and physical ailments. Each chapter addresses an unpleasant aspect of city life (noise, violence, moldy food, smelly streets, poor air quality), and the volume is enhanced with a rich array of illustrations. Awakening both our senses and our imaginations, Cockayne creates a nuanced portrait of early modern English city life, unparalleled in breadth and unforgettable in detail. 1. Hubbub. 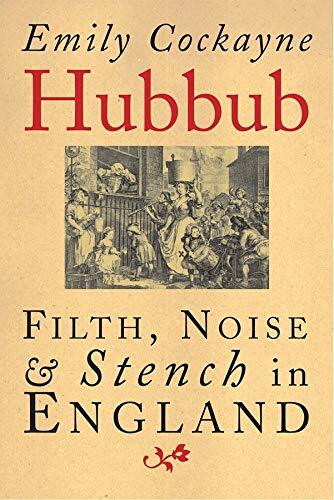 Filth, Noise, and Stench in England, 1600-1770.